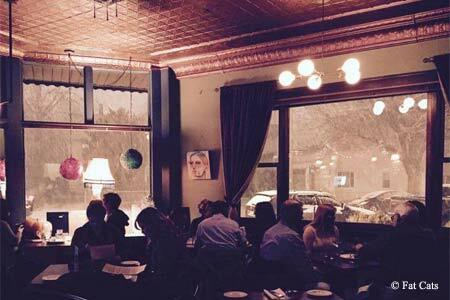 This quiet restaurant tucked deep inside Tremont offers a whimsical menu and imaginative cuisine. Lunch & Dinner Mon.-Sat., Brunch Sat. : Fat Cats is situated in a small, unassuming Ohio City house that just happens to have one of the area's most striking skyline views. It calls its menu eclectic, but there is a strong thread of Italian with a few Asian and regional seacoast influences throughout. The delights are in the details: Brussels sprouts seared in brown butter, paired with apple and preserved lemon; crispy egg rolls served with spicy apricot mustard; butternut squash soup topped with earthy cashew crème. The menu changes frequently, usually incorporating local and seasonal ingredients (some hailing from as close as the garden out back). Friendly staffers and a full bar are even more reasons to head on over to this near Westside gem.